How many different ways can someone say “hello”? Well, that’s actually a pretty tricky question. It’s hard to know how many languages actually even exist in the world, there are so many. Sometimes it’s difficult just trying to distinguish between different dialects of the same language; however, people have estimated that there are somewhere close to 7000 languages in the world today! That means that there are 7000 different ways to say “hello” to one another. It’s a bit of a difficult concept to wrap the brain around—just think—it’s pretty safe to say that there are more words that mean “hello” in all the languages of the world than there are words that you might speak today! Now that is absolutely crazy! It’s pretty much unfathomable. So what do you do to celebrate World Hello Day? Well, it’s pretty simple. Say “hello” to everyone you see. Say it to your mom, your dad, your siblings, your dog, your friends, to strangers, say it to your camp trunk from Everything Summer Camp if you want! No “hello” is too eccentric on World Hello Day. 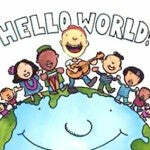 The idea behind World Hello Day is to get a message to world leaders. The message: to use communication over force when taking care of conflicts. The world has been celebrating Hello Day since 1973 and its popularity has only gone up over the years. So, for the first time, I’ll end today’s post by saying, Hello!